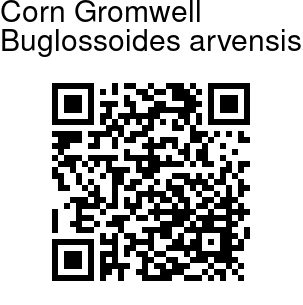 Corn Gromwell is an annual herb up to 40 cm long. Stem is branched from the base, antrorsely hairy: hairs from a swollen base. Leaves are hairy with hairs pointing upwards, middle and upper leaves 10-30 x 4-6 mm, inverted-lanceshaped to lanceshaped; basal leaves similar but larger. Flowers are borne in racemes at branch-ends, nearly stalkless. 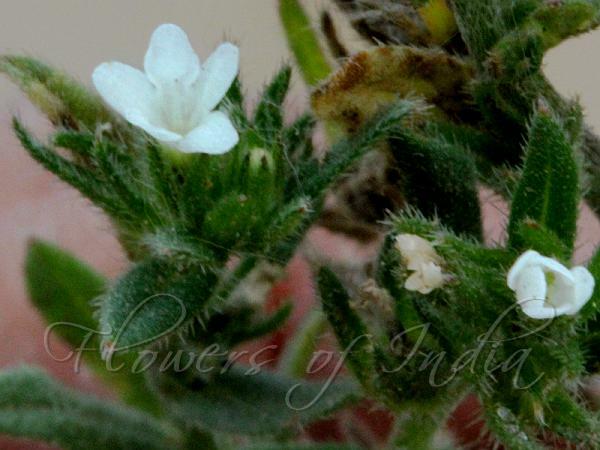 Flower-stalks are up to 2.5 mm long, velvet-hairy. Calyx is hairy, sepals 5-6 mm long, linear. Flowers are tubular to funnel-shaped, pale blue to white, hairy on the outside; tube 3.8-4.5 mm long, sparsely hairy internally to about middle; limb 4 mm broad, lobes oblong-ovate. Nutlets are 2.5 mm long, pear shaped, gray to brown, tuberculate, areola slender. Corn Gromwell is found in S. Europe, Iraq, Iran, Afghanistan, Pakistan, eastward to Kashmir, Japan, up to altitudes of 1400 m. Flowering: March-April. Identification credit: Gurcharan Singh Photographed in Pampore, Kashmir.